We're rate 5/5 for service! All ready for immediate dispatch. 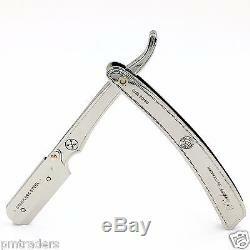 Parker SRX Heavy Duty Professional Stainless Steel Cut-Throat Razor. 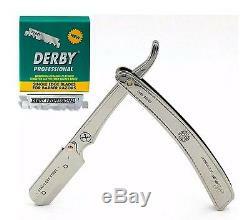 Includes 100 Derby Professional Single Edge Blades. Except weekends & bank holidays. NEW for 2016 Parker Safety Razor's Cut-Throat razors are used in barbershops and shave parlours worldwide. The unique "clip to close" mechanism on this razor keeps the razor blade securely in place and perfectly aligned. This top-quality heavy duty Parker SRX razor has a stainless steel blade arm in addition to a stainless-steel handle - not lower quality aluminum. Derby Professional Single Edge Blades. All Derby razor blades are manufactured from stainless razor blade steel strip imported from Sweden and are perforated, hardened and ground by utilizing most advanced equipment. All Derby razor blades are coated with a polymer for optimum SHAVING COMFORT. From beginning to end, and are subjected to severe Quality Control Inspection at every stage of manufacturing processes by utilization of unique quality control equipment. Razor handle weight: 2.3 oz. Length: 5 1/4 in approx. Safety razors offer substantial savings over cartridge razors. A top quality heavy-duty razor designed for professionals. Rounded exposure at the end of the blade compartment to minimize cuts. Clip/Lock blade holder along with inserts to ensure secure blade insertion. 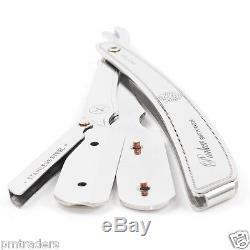 Accepts barbershop single edge blades or 1/2 double edge blade. Includes 100 Derby professional single edge barber blades. By purchasing you are confirming that you are over the age of 18 when purchasing these items. If the item is damaged in transit, please sign the carriers/Royal Mails note as damaged, please look out for mishandling - crushed boxes, flattened corners, etc. We cannot be held responsible if you do not follow this. All claims for non-received items must be made within 28 days; all claims for non-received items after 28 days will not be accepted. You agree to co-operate with us fully in the event of a loss/damage claim. Due to hygiene reasons most products are non-returnable unless found to be faulty. If the item is faulty on arrival, please advise us within 3 days of receipt. We may try to assess the fault before allowing you to return the item, please be patient. When returning items to us, please ensure they are well packed. Welcome to RazorBlades4u, your online shop for cheaper shaving products and shaving accessories. We are a family run business with an excellent reputation for excellent customer services. We stock all leading manufacturers including Wilkinson Sword, Gillette. HeadBlade, King of Shaves, Parker and Goateesaver. We're a UK based company dedicated to providing a leading range of shaving accessories, all at amazing prices. Item arrived very quickly, as described and well packaged. A+++++++, spot on, thanks, will use again. The item "Parker SRX Heavy Duty Professional S/Steel Cut-Throat Razor & 100 Derby Blades" is in sale since Saturday, March 4, 2017. 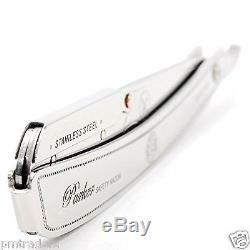 This item is in the category "Health & Beauty\Shaving & Hair Removal\Razors & Razor Blades\Men's Razors". The seller is "pmtraders" and is located in Coventry, West Midlands. This item can be shipped to all countries in Europe, Australia, United States, Canada, Brazil, Japan, New Zealand, China, Israel, Hong Kong, Indonesia, Malaysia, Mexico, Singapore, South Korea, Taiwan, Thailand, Chile.